To eventually determine which playoff teams might potentially emerge as Conference Champions based on the strength of their division. To determine which team might win the Super Bowl based on the overall strength of their conference. We simply felt it’d be interesting information to keep track of as the season progresses. 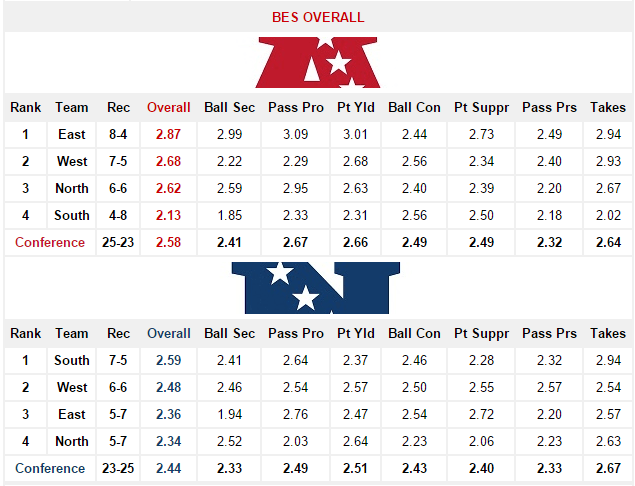 In this inaugural edition of the BES Conference Report, we find the AFC East is the league’s strongest division according to our data. The Patriots (3-0) are ranked No. 2 in our Week 3 BES Rankings. Not far behind them are the Jets (No. 7) and Bills (No. 12) to round out three AFC East squads among the BES Top-15. The only other division that can make that claim is the AFC West (No. 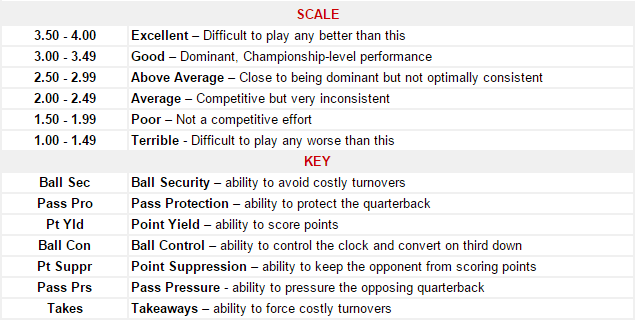 2) which features the Broncos (No. 1), Chargers (No. 13) and Raiders (No. 14). Therefore, at the moment it’s not difficult to fathom the winners of the AFC East and West facing off for the conference title in January. Meanwhile, the NFC is led by the South with both the Falcons (No. 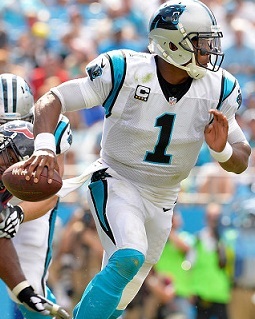 3) and Panthers (No. 8) owning spots in the BES Top-10 and have yet to lose a game. The Falcons have already conquered three-fourths of the NFC East (No. 3). The Panthers schedule has been less impressive with two wins against AFC South (2.13) teams and a victory over the winless Saints, ranked 29th in team rankings. Many would argue the Packers (No. 4) are the best team in the NFC despite them representing the conference’s weakest division by our data. That’s due in large part to the Lions (0-3) and Bears (0-3) ranking 31st and 32nd respectively in team rankings. Overall, this is just an early glimpse at how both conferences and there respective divisions are performing. It’ll be fascinating to witness how much these rankings shift between now and Week 17. But for the time being, they definitely make for good water-cooler material and info to digest while sipping your morning coffee.